The clam chowder at this San Francisco institution tastes like a hug feels, thanks to stick-to-your-ribs consistency, finely chopped clams, and bacon. But you're gonna have to wait for it, probably more than an hour (but at least you'll get to do it while holding a beeper that's shaped like a lobster). The wait staff at this charming, narrow restaurant is almost as salty as the chowder -- but in a good-natured, we’ve-been-here-forever way that kind of completes the experience. 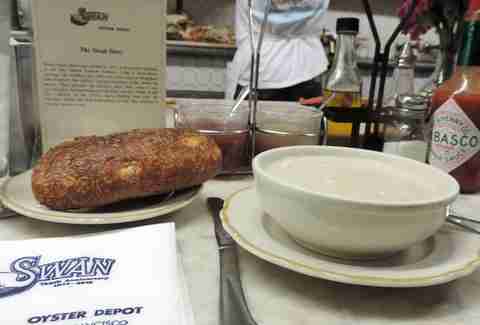 This 100-year-old fish market obviously serves a mean clam chowder -- this shouldn't surprise anyone. What should, though, is the fact that a bowl is a mere $5 (the price of some lattes less than a mile away). Also kind of awesome: one of the friendly fish-slingers will personally chop up the day's clams (likely brought in that morning), tossing them in a chowder that's thin -- buttery and briny -- rather than thick and creamy, but still comes with 1) a flavorful punch and 2) a loaf of bread and butter for a dollar more. Pro tip: there’s always a line for this spot, but if you come alone, chances are you’ll be able to cut ahead. When you do finally score a seat at the counter, definitely add Dungeness crab and oysters on the half shell to your order. Fisherman’s Wharf probably has more crab stands than it does fishermen at this point -- which can make things overwhelming. 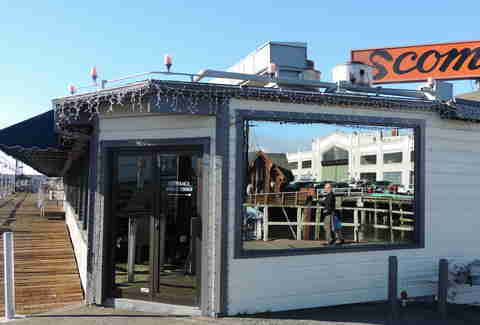 Skip the first stand on the wharf and head to the almost-identical Crab Station next door. You’ll especially enjoy this rendition if you like your chowder on the thinner side and super clammy (we counted 14 pieces of clams in a single cup). If clams aren’t your thing, then... uh... why are you reading this article? Oh right, for the tasty crab chowder at this stand. It has the consistency of super-thick (almost pudding-like) New England chowdah, but it tastes totally different, and has a slightly greener color. 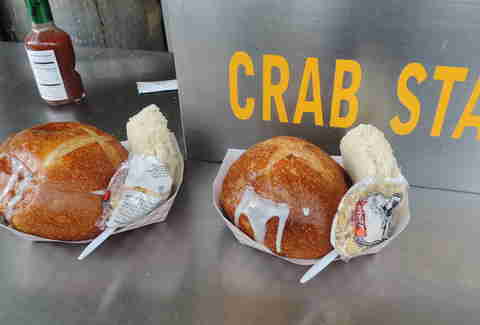 It's filled with rock crab (so it’s not fresh), but it is flavorful. The whole kernels of corn also lend it a pleasant sweetness. Alioto’s is THE place to hit on the Taylor and Jefferson strip -- and not just because they throw in a Budweiser for only $3 more. It’s got Goldilocks-level thickness and is particularly heavy on the clam flavor. The guy behind the counter let us in on a little secret: the stand gets the soup from the fine dining portion of the operation upstairs, so unless you’re dying for full service, grabbing a bowl at this stand gives you the biggest bang for your buck. The clams are fresh, large, and chewy, and the broth has a nice bay leaf flavor. Stand number nine makes this list for its super-herby flavor. While the chowder is still as salty as your typical example, Fish Grotto doesn’t skimp on the other spices, so you enjoy a rounder, more robust taste that's milder on the clams and slightly thicker than Alioto’s. You can get cheaper chowders at one of the stands a few blocks away, but here you’re treated to views of actual fishermen (a rare sight on the wharf) and an Old San Francisco vibe. 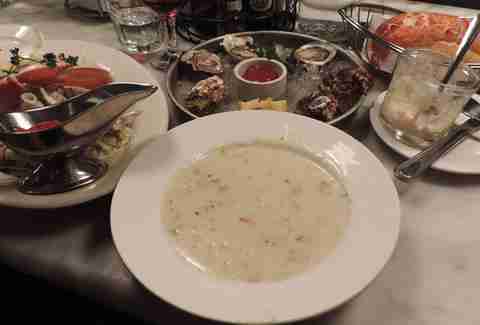 The chowder is delicious, too -- as thick as it gets and loaded with four different kinds of fresh clams. For every 15 New England-style chowders in this town, there’s one Manhattan-style -- Boston-style’s lighter, tomato-y sister soup. 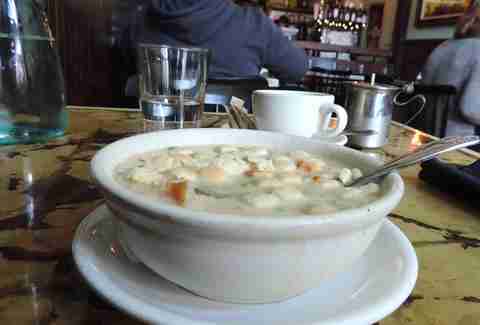 And even harder to come by is Hartford Chowder, which -- you guessed it -- is a mixture of the two. But you can get all three at this casual eatery with a New England fish-house vibe. 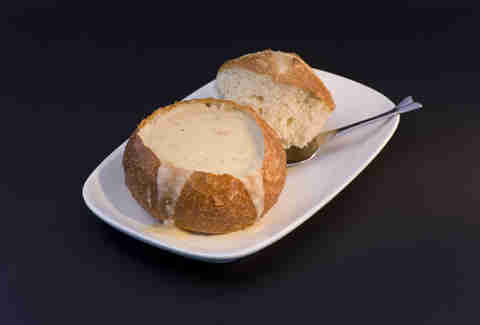 The New England chowder comes with a splash of white wine, which brightens and rounds out the flavor. And the Manhattan is delightfully tangy -- a great choice if you’re looking for something a little less rich. Flecks of flavorful scallions and colorful slivers of carrots offer a subtle twist on the classic. The soup is right in between thick and thin, and the rustic potatoes with the skin still on them are hearty and perfectly cooked (read: not too mealy). There’s generally no wait at this funky, hidden spot on Mission St and you can get bottomless mimosas for $10 on weekends until 3pm. Medium-thick broth + mild, herby flavor = this tasty classic. Bonus: if you like a little soup with your oyster crackers, they've got extra packets up for grabs in massive shells on the bar. DOUBLE bonus: they also happen to have a killer happy hour everyday from 3-6pm with $2.50 draft beers and $1 oysters. This casual, nautical Castro institution is so popular taht people show up a full 30 minutes early to write their name on the chalkboard, specifying down to the minute when they arrived. Overkill? Maybe. But also a testament to how fresh and perfectly simple the dishes are. The chowder is no different -- classic, mild, creamy, and served with both oyster crackers and a few pieces of sourdough. In a feat of chowder engineering, the celery pieces manage to still have a slight crunch to them. 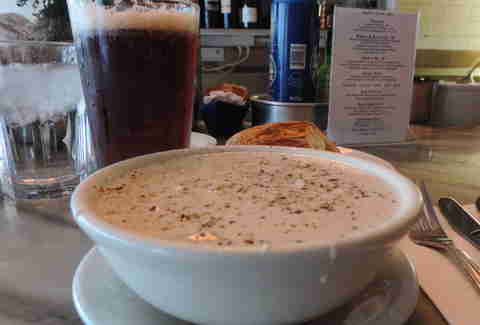 We like this outdoor spot for its live music, Bloody Marys, and general merriment, but we LIKE like this place for its more-than-decent chowder that’s peppery, herby, and filled with big chunks of clams and potatoes. Plus, something about being on the waterfront among actual fisherman just makes this chowder taste better. 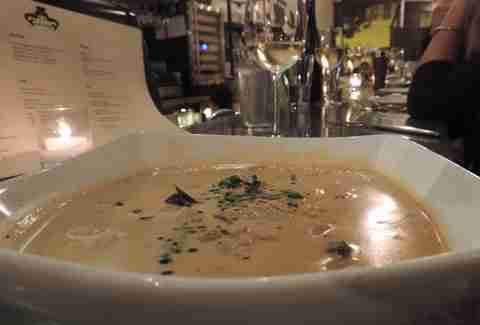 The most creative take on chowder comes from Bar Crudo on Divis. The broth is impossibly rich and tangy, with a creamy tomato base, and comes loaded with fish, squid, muscles, and thick pieces of smoked bacon. It’s kind of a nice place, so maybe don't lick the bowl? Pro tip: Snag seats at the bar during happy hour (5-6:30pm) when a cup of the chowder goes for $6 and you can pair it with $1 oysters and other discounted specials. Relatively light on the clam flavor, cream and potatoes are the star of this super-thick, gloriously white rendition, making it perfect for the seafood newbie who’s wary of anything too fishy. The flagship bakery hall on Jefferson St is the spot to take visitors (they have a tour on-site), while the Market St location will satisfy mid-week chowder cravings. 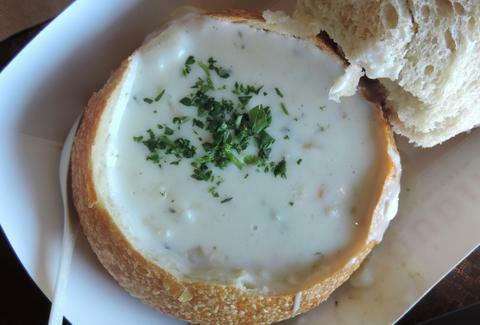 Either way, get the sourdough bread bowl because, sourdough bread bowl. This recipe is as old as the restaurant it’s served in (154 years! 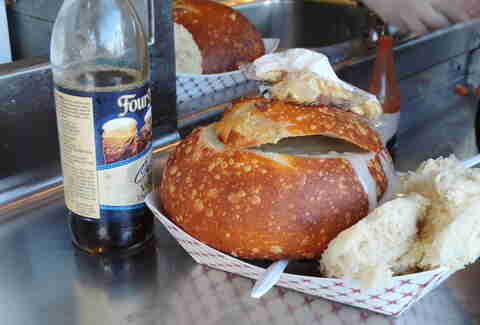 ), making it one of the original San Francisco chowders and completely worth the trek to Bayview. Homemade clam sauce and fresh clams are simmered in a rich broth and served in a sourdough bread bowl made fresh daily -- it doesn’t get much better. Can’t get enough clams? You’re treated to a shot of clam juice as an aperitif no matter what you order. While $14 is a little steep for a bowl of something you can get for half the price elsewhere, Hog Island sets its clam chowder apart thanks to the loads of Tomales Bay clams in the shell loaded on top. Plus, it’s the Ferry Building and you’re partly paying for the tourist-friendly views of the Bay Bridge and fresh sea air. Treat yo’self.